You are here: Home / Uncategorized / Introducing Our NEW Facebook Page! Introducing Our NEW Facebook Page! 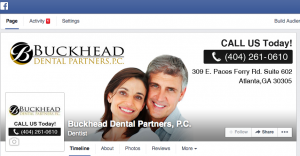 At Buckhead Dental Partners, we’ve worked hard to build a dental practice with you in mind! We are always looking for ways to improve our service for our loyal patients! That’s why we are proud to announce our brand new Facebook page. Click here to check it out! This page is designed to provide you with exciting updates about our practice and give you a fun way to communicate with us! We are also excited to announce that we will be posting great promotions each month! Visit our page and “like” us to take advantage of these specials!